From the Interstate 1-10, take the Speedway Blvd/University of Arizona exit 257. Turn left onto W. Speedway Blvd. Pass lights at Stone Avenue, N. 6th Avenue, N. Euclid Avenue until you reach Park Avenue. Turn right (south) onto Park and travel past 2 stop signs. At University Avenue, turn left into campus. 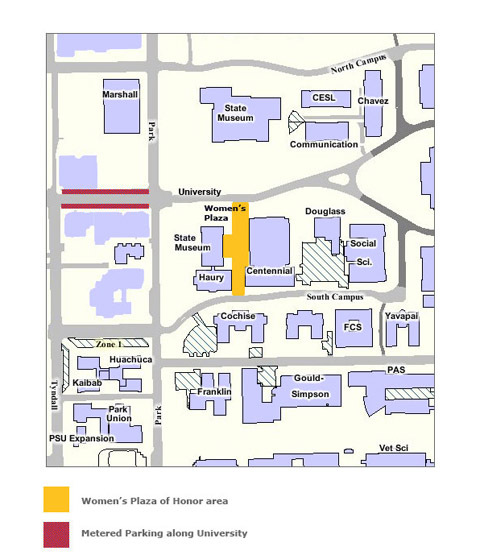 The Women's Plaza of Honor is on your right just before Centennial Hall. Head south on Park from Speedway Boulevard. Turn left onto University Avenue and enter the University of Arizona Main Gate area. 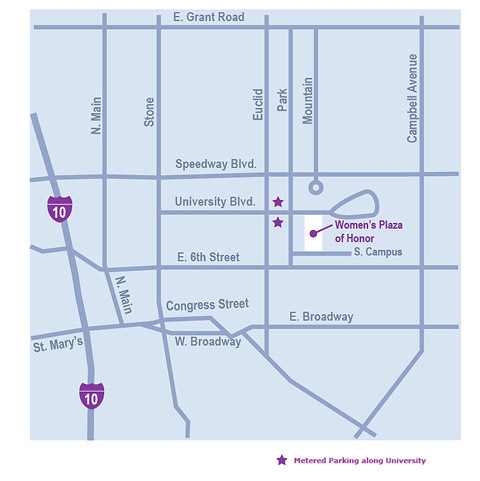 The Women's Plaza of Honor is located on your right just before Centennial Hall. The plaza is sandwiched in between the Arizona State Museum's south wing and Centennial Hall. It forms the passageway in between these buildings from University Avenue to South Campus Drive.